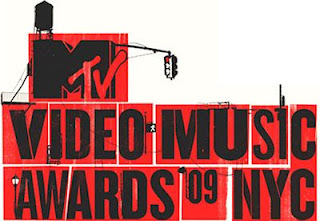 Ok, so I didn't honestly think that I was going to watch the entire MTV Video Music Awards show, let alone write a review on it, but shoot, the thing got more and more interesting as the night went on so I had to! LOL so let me talk about some of the key moments. Second, MR. KANYE WEST. Kanye, Kanye, Kanye.....ummm...NO!!! I seriously got up and started screaming out of embarrassment for Taylor Swift. For those of you who for some reason don't know what happened LOL, Taylor won Best Female Video, and Kanye proceeded to take the mic away from her while she was making her speech, saying basically that Beyoncé deserved the award. Ughh...Kanye. Now I completely agree that Beyoncé deserved that award, but it was not Kanye's right to speak up and take away Taylor's moment. I can't believe him sometimes. That was so rude! Kanye needs to just sit down sometimes and shut up. Just sit there! Dang! And what can I say Lady GaGa and her outfits? LOL she is truly unique, I must say. The blood at the end of her performance was completely baffling to me, but she is starting to grow on me. But did yall see that one outfit, the all red one and she had her face completely covered with that mask? LOL she had to take that thing off to keep from suffocating on stage when she accepted her award! But I do acknowledge that Lady GaGa is definitely her own person and she's cool. Beyoncé killed her performance too. I loved it! And Miss Beyoncé, you are a real class act. Letting Taylor have her time to shine after you won your Video of the Year award! That was very, very nice of you man. I was seriously impressed. People can say it was for publicity or whatever, but she definitely did the right thing, showing again why Beyoncé is a real classy woman. And yeah DMV was in the building tonight!!!! Wale ripped the stage all night on the sidelines!!!! LOVED IT ALL!!!! DC CHILLIN, PG CHILLIN!!! Jay-Z, shout out to you. You and Alicia Keys were cool too. And I finally got to see my preview for "This Is It! ", the new Michael Jackson movie coming up on October 28! It was great!!! I can't wait to see it!!!! Yeah, BET you were DEFINITELY outdone this year. Sorry. Better step your game up!! MTV gonna mess around, come back, and stomp yall to the ground. Just saying. Khloe Kardashian and Lamar Odom Married! Sarah Michelle Gellar Has A Baby Girl! !